bike to work – WeLove2Bike! 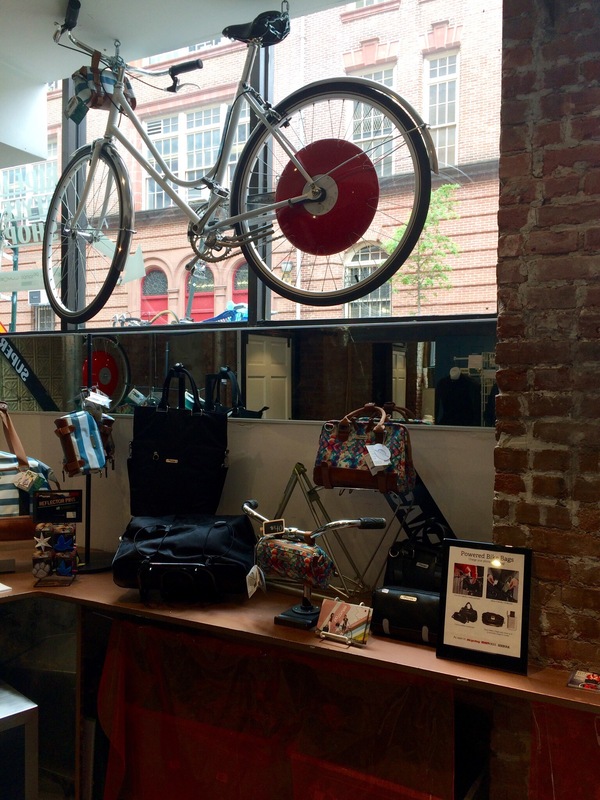 What manufacturer wouldn’t love to see their product retailing in a Manhattan storefront? 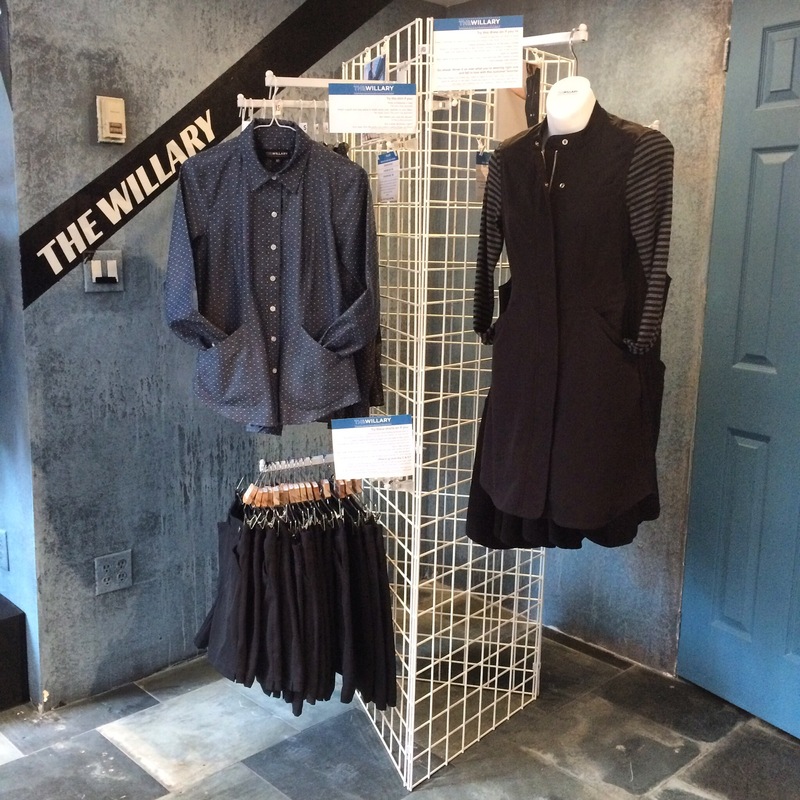 The invitation to participate in a shared pop up shop on Manhattan’s lower east side was that exciting. While it’s not the same as having an established shop carrying your line, it’s still a big deal. At least for me it was, and I was determined to make the most of the opportunity. Maria Boustead, founder and designer behind Po Campo Bike Bags, was the organizer who came up with the idea and brought it to fruition. 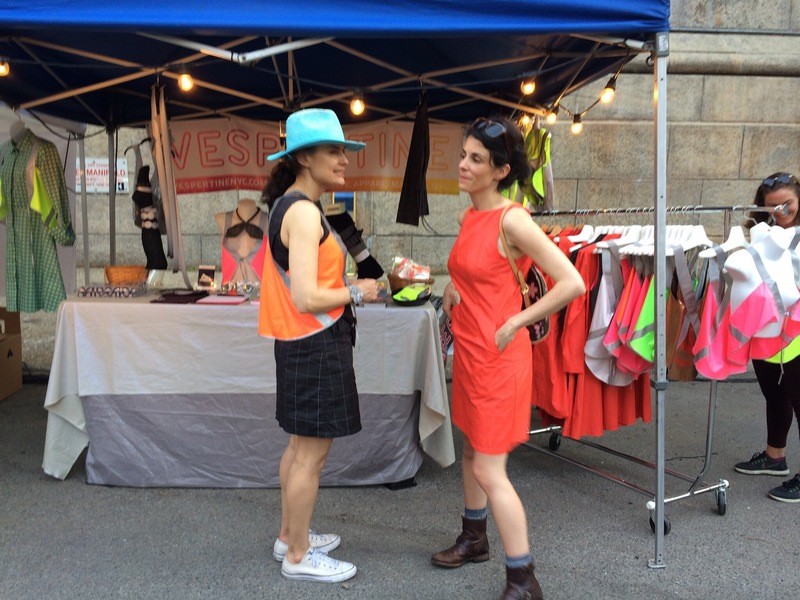 She brought together 8 different independent brands who all support biking in style, pooled our resources, and rented a storefront in Manhattan’s Lower Eastside/Chinatown area for Bike Week (May 12-21), and called it the Ride In Style Shop. I wasn’t able to be there until the closing weekend, but I arrived just in time to join the group for a special, one-night pop up in Brooklyn at the Bike Home From Work Party. I went straight from Newark Airport to the Dumbo Triangle in Brooklyn. It was a great night, and we met a lot of people. 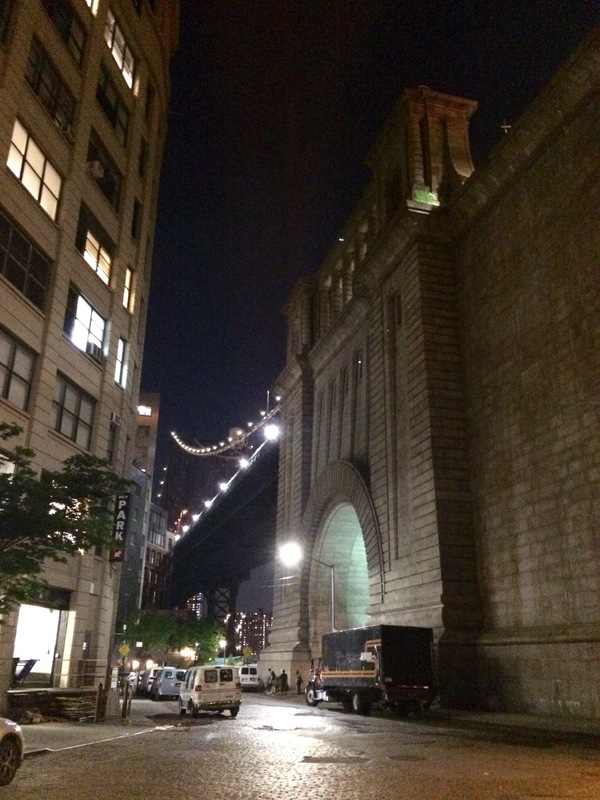 It was my first time to see the Dumbo Arch, and I was struck by its architectural beauty. First thing the next morning, I had to rise and shine and get to the Ride In Style Shop for my turn to staff the store. I was excited to wear my black Bike It Or Not Two Piece Dress with the new Romantic Ruby Bloomers from the Jeweltone Collection, topped off with a gorgeous Japanese silk scarf that had been my mom’s and would look great with the bold red of the shorts. I had just received a few samples of the Jeweltone Bloomers in time for the trip, but then realized I had left them at the shop after the Brooklyn event! 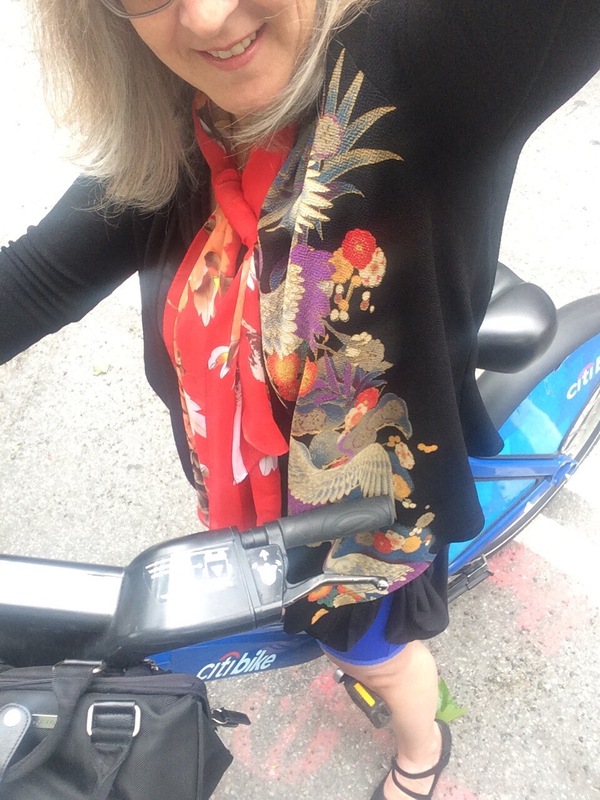 This photo shows me in the blue sample shorts that don’t match the scarf, but pair wonderfully with the Citibike! 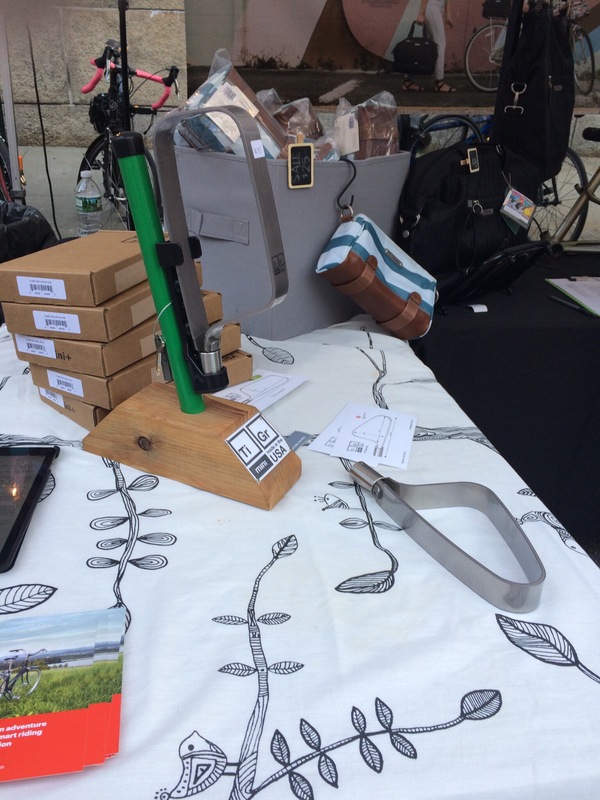 Each brand hosted an event during the pop up shop week, and on Sunday, I hosted a workshop called Bike Commuting Made Easy. My tips for making it easier to incorporate biking into your everyday transportation has been posted on the blog here. 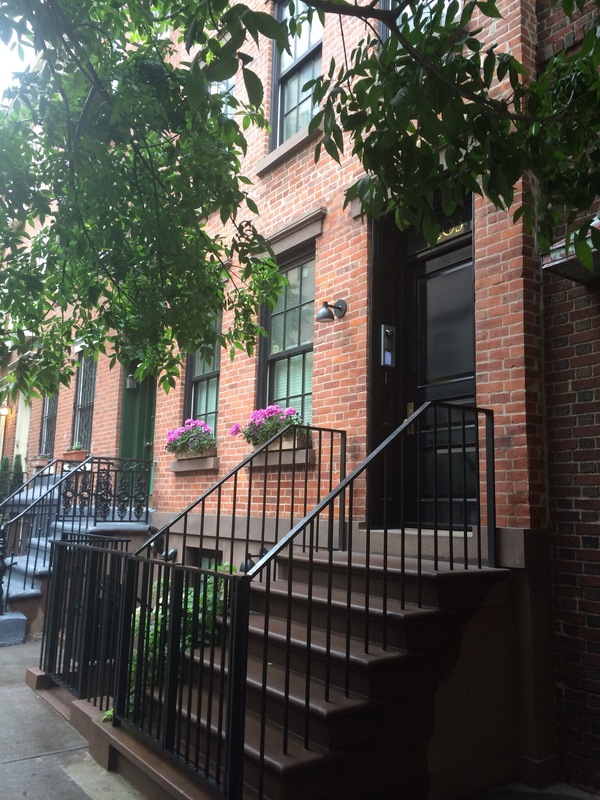 I enjoyed commuting from my friends’ place in the Village to the shop in Chinatown/Lower Eastside. It’s always fun to explore a city’s bike infrastructure. 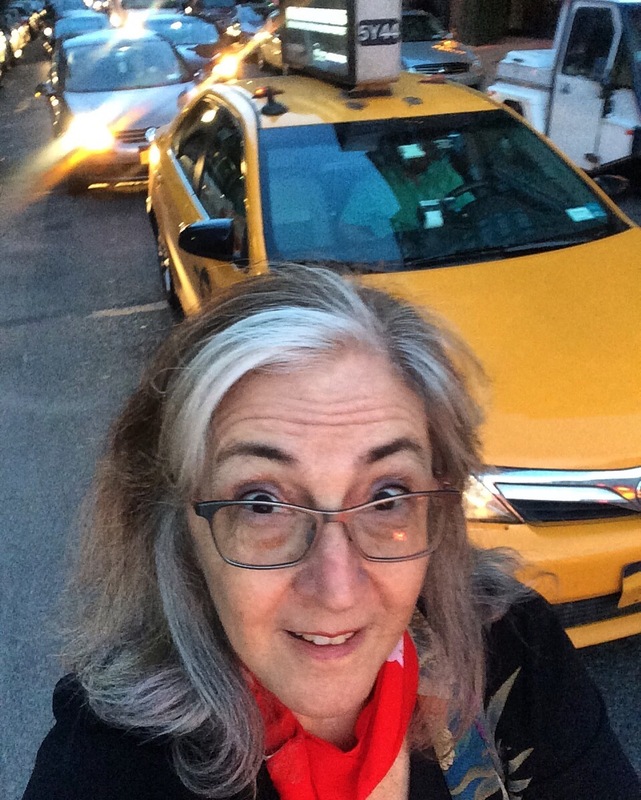 While biking the busy streets of Manhattan can seem intimidating at first, when you realize how slow traffic moves with all the congestion, it’s actually quite easy to take the lane when necessary (which is any street that lacks an available bike lane). I had a free day in the city before my return to L.A. Although it was rainy, I had fun walking around the Village. I treated myself to a delicious lunch at Lafayette Bakery & Cafe. It was also my first chance to try out the new Shimmering Sapphire Bloomers. That evening, I had to thank my gracious hosts, Alex and Miki, who provided me a place to stay so convenient to the Ride In Style Shop. We went to Robataya, a Japanese place Miki knows nearby that specializes in robata, a Japanese grilling method that I love. 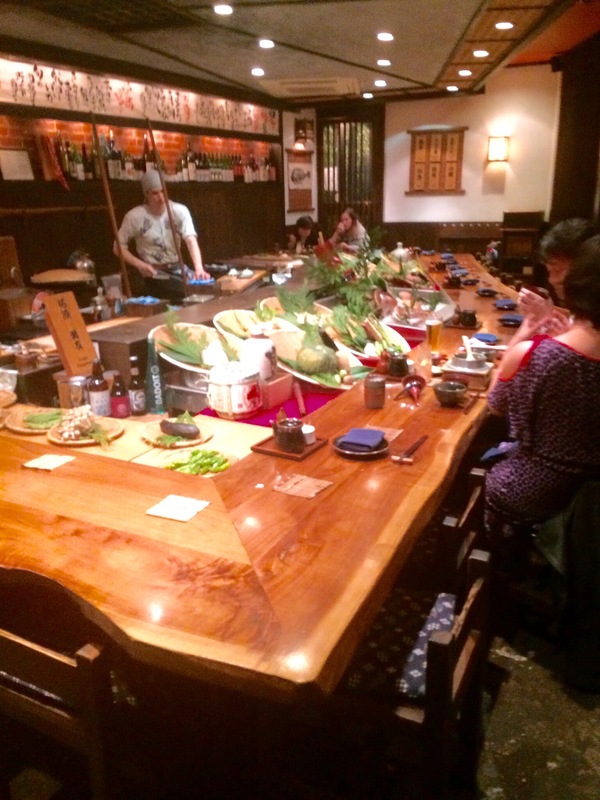 It was beautiful inside, and made me feel like we were in Japan. The food was excellent. All in all, it was a fantastic trip. A little crazy, figuring out how to ship my product in advance and plan for a set up that would be implemented by others in my absence, then squeeze in a cross-country trip for the weekend. It all worked out, and I have no regrets! Bikie Girl recently participated in the Ride In Style Shop, a pop up shop held during Bike Week in Manhattan, and featuring eight indie brands, all providing gear to help city cyclists ride in style. To make it more fun, each brand sponsored an event. Bikie Girl provided a workshop called “Bike Commuting Made Easy”. 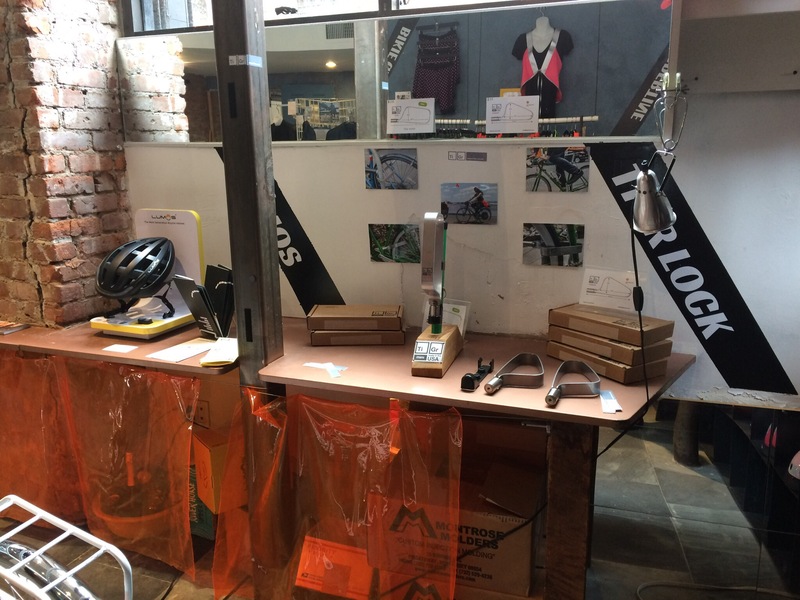 Here’s a summary of what we covered in the commuting workshop, as well as a glimpse at the different brands featured in our shop. Keep it simple at first. Establish a small goal: to bike to a nearby store for an errand, or to bike home from work one day this week. You will be going through the planning and execution logistics, and perhaps overcoming some trepidation, and that is enough for the first time at it. Make sure you are ready by thinking through the following items to ensure a positive experience. 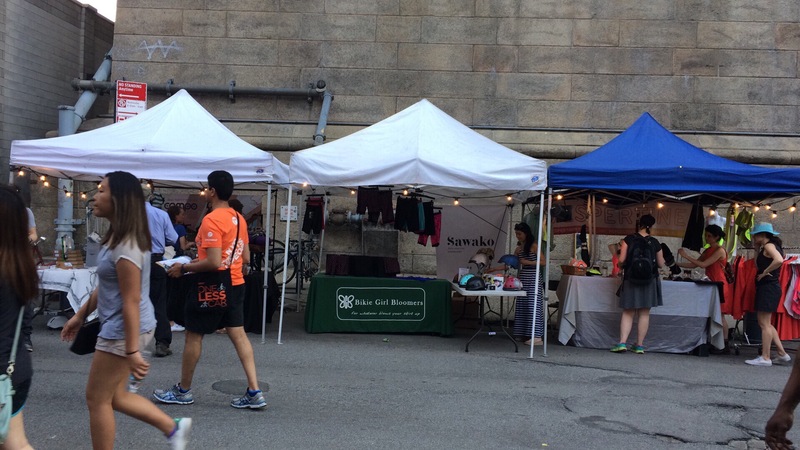 If you are new to city riding, you might start out with recreational social rides led by a local bike advocacy group. Riding with a group can make city riding safer, teach you city riding skills, and introduce you to others who like to ride. It’s also a great way to discover parts of your city you never knew. Social rides and open streets events can be a fun way to get more comfortable with city riding. If you will ride your own bike, consider taking it to a local bike shop for a tune up and safety check. If you don’t know how to fix a flat tire, now is the time to learn and practice (you can find tutorials on youtube). The weekend before your first ride, check your ABC’s: A – air in the tires; B – brakes working properly; C – chain is clean and lubed. Re-check these before each ride. It’s normal for your tires to need a little more air, or for your chain to need some cleaning, about once a week or so. Checking these items regularly will also make it easy for you to notice when the brakes are getting worn, or another repair is needed. Commuting by bike share means you don’t have to worry about bike parking and maintenance. If you will use bike share, go to the web site for your city’s bike share system and familiarize yourself with how it works, what you need to check out a bike, and where the docking stations are for your start and stop points. Download an app to make it easy to find bike share stations while out and about. The Spotcycle app works with most bike share systems. 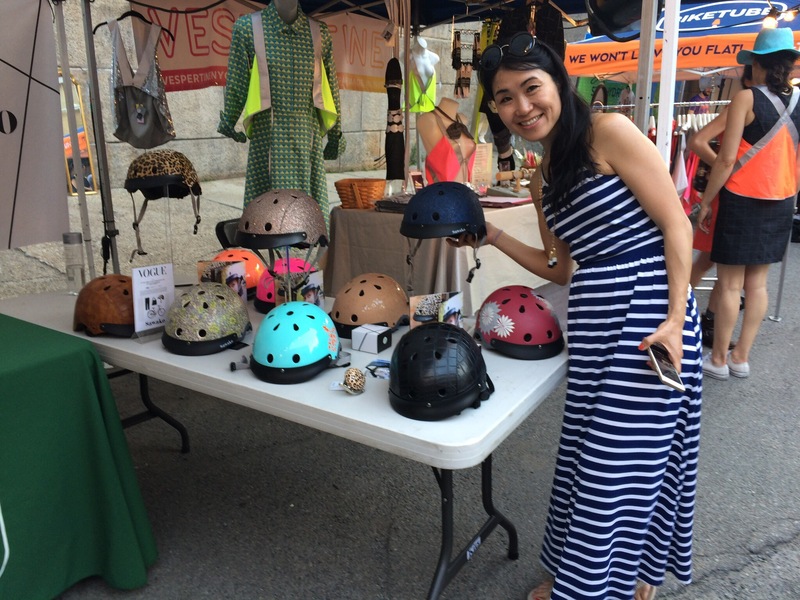 Sawako designs helmets in high style. The basic gear needs include: helmet, lights, and something to carry your stuff. 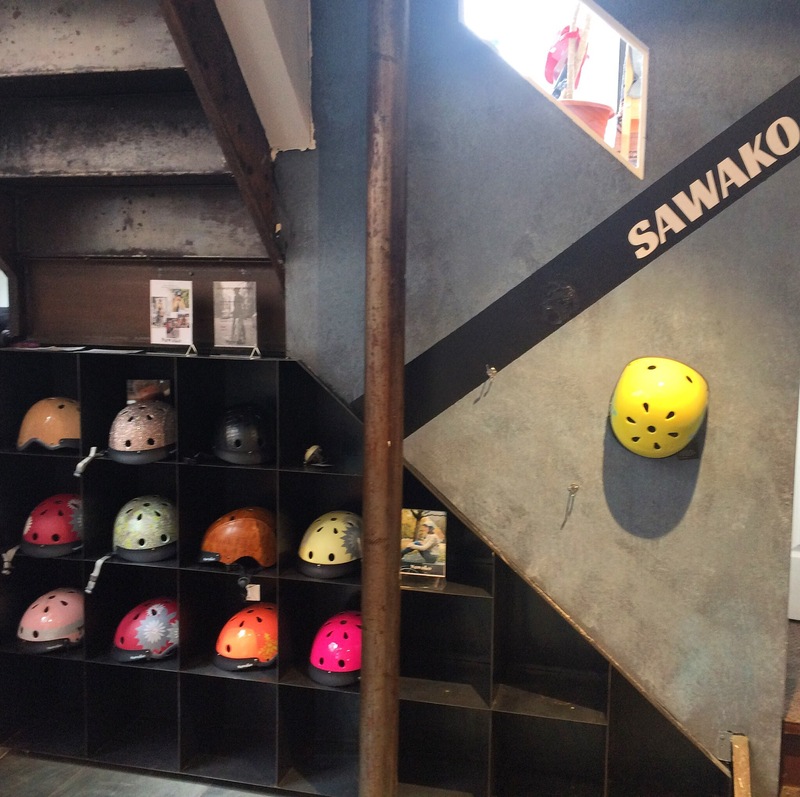 Helmets are available in stylish designs (see those by Sawako), and with lights to signal braking and turning (see the Lumos helmet). If taking your own bike, you will want to carry a patch kit, extra inner tube, a pump, and bike tools, such as a multi-tool. Keep a quality lock with you, even if you can park the bike inside, as you may need it when stopping for an errand. High quality theft-resistant locks can be heavy, but TiGr offers titanium locks that are strong, light and stylish. Gear that makes the commute more pleasant: fenders, a chainguard, a good saddle properly adjusted, a basket and/or rack, phone holder, and a kickstand. Other gear that can be worth the investment: handlebars/bike that support upright riding position, dynamo lights, panniers, platform pedals that work well with street shoes, and a power bank to re-charge your phone or lights. An electric assist bike can be practical if the commute is long and/or hilly. Although electric assist bikes cost significantly more than regular bikes, they are a fraction of the cost of a car, and well worth it if it makes it possible to commute by bike more often or at all. Superpedestrian offers the Copenhagen Wheel, which can turn a regular bike into an electric assist. 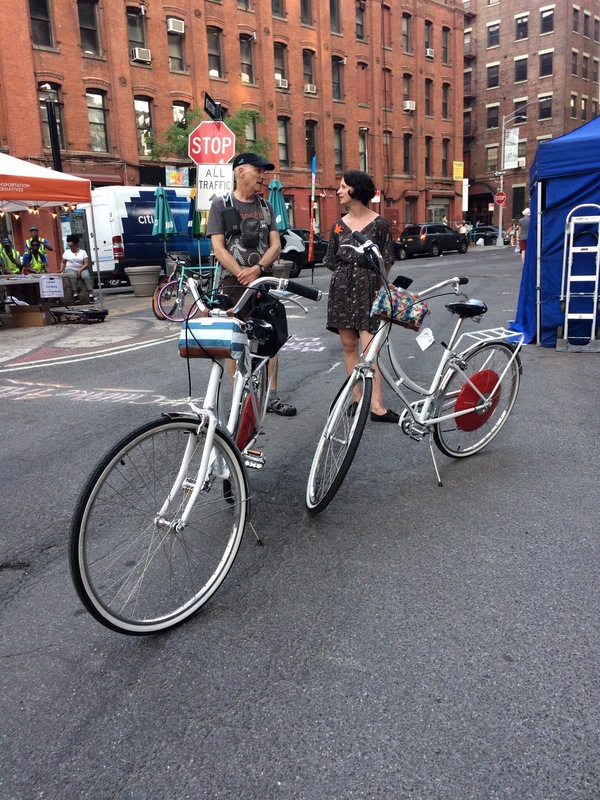 I had fun trying out the Copenhagen Wheel at the Ride Home From Work Party in Brooklyn. The Wheel really gives your ride a boost. You are likely able to ride in whatever clothes you wear to work. Exceptions are avoiding or adjusting for long, flowy items that might get caught in the spokes, or dealing with hills, distance, or weather that leaves you too sweaty or wet. You can pin up, anchor, or tie a knot in a long, loose skirt, or use a pant clip or slap band to keep pant legs out of the way. For sweaty situations, you can bring fresh clothes with you and change at work. Some work places offer shower facilities or have a gym close by. Many bike commuters keep extra clothes at work, or bring a week’s worth to the office at a time. You can also keep a kit of toiletries at work to use for freshening up. Consider a small towel, cleansing wipes, deodorant, and a comb or brush. Bikie Girl Bloomers can protect your dignity in style. Experiment with different clothing to find what is most comfortable. 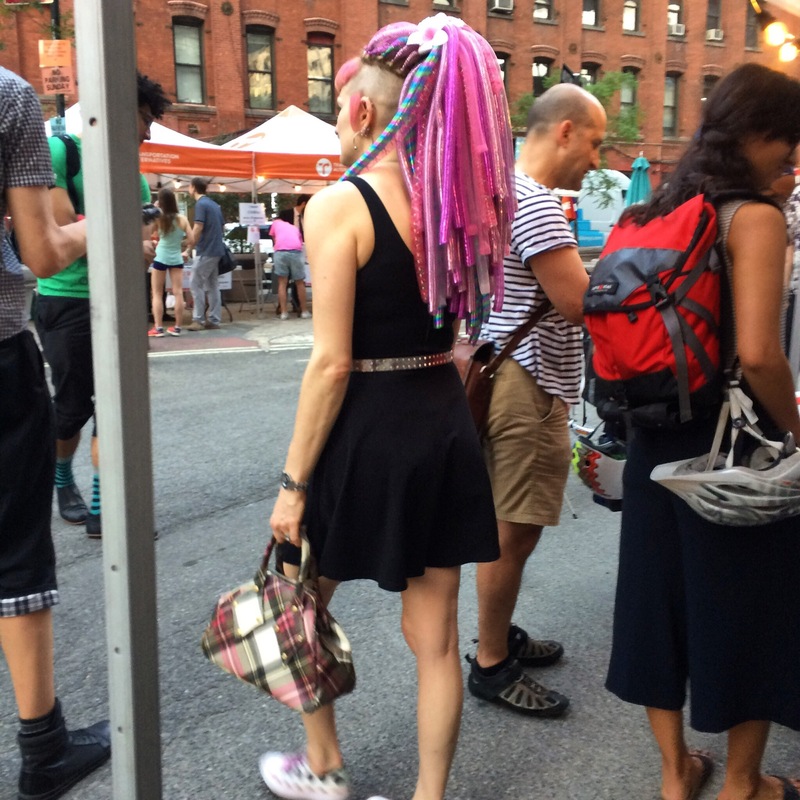 Some prefer pants, others prefer the freedom of movement provided by a skirt or dress. Pants can easily wear out from bike riding, so consider a style designed for the durability and flexibility biking requires, such as The Willary’s Core Pant. Skirts and dresses can be combined with a lightweight bike short, tights, or leggings for coverage and/or warmth. If needed, you can wear a padded bike short for the ride in, and switch to regular pants upon arrival. Let the bike shorts air out during the day so they are at least partly refreshed for the ride home. The best route for biking to work is likely different from the route you would take by car or other means. Most cities provide a map of bike routes, bike paths, and bike-friendly streets. Google maps and other bike routing software can help you figure out a suitable route. Test ride your route on the weekend to make sure there aren’t any unpleasant surprises and to get familiar with your route when there is less traffic on the roads. Keep in mind that occasionally Google maps will direct you to cross a major street without a traffic light. If you get stuck in such a situation, consider taking the sidewalk (walk the bike if sidewalk riding is not legal in your city) to access the nearest crossing with a traffic light. Options for carrying your things include: a messenger bag (make sure it is stable while riding), backpack, basket or panniers. A bag that is against your back will create much more sweating, so many prefer a basket or a pannier that attaches to the rear rack. Po Campo provides a variety of stylish options that include bags that hook on your bike and can also be your professional-looking briefcase or handbag. Rear-mounted bike baskets allow for a more stable weight distribution, while front baskets provide easy access while riding. Your choice will also be influenced by what you need or will have to carry with you upon arrival. Think also about whether your arrangement will be used for shopping or carrying children. Know your local bike laws. The most important keys to safety relate to being visible and predictable to others and being prepared for the unexpected. Ride with the flow of traffic, and take the lane when sharing the road with motorized vehicles. Riding too close to the edge of the lane makes you less visible to motorists and can encourage drivers to pass you too closely. Allow 3-5 feet between you and parked cars to avoid getting doored. Avoid weaving around parked cars, as that can catch motorists by surprise when you re-enter the traffic lane. Be aware of others traveling on foot, bike, or by car. Signal your turns, and use vocals or a bell to let others know you are approaching them to pass or to alert pedestrians. You can increase your skills and confidence by taking a class with your local bike advocacy organization. Click here to see some examples of the skills that will help you handle dicey situations that can arise on city streets. Wear reflective clothing at night, and use a white light in front and a red light in back. 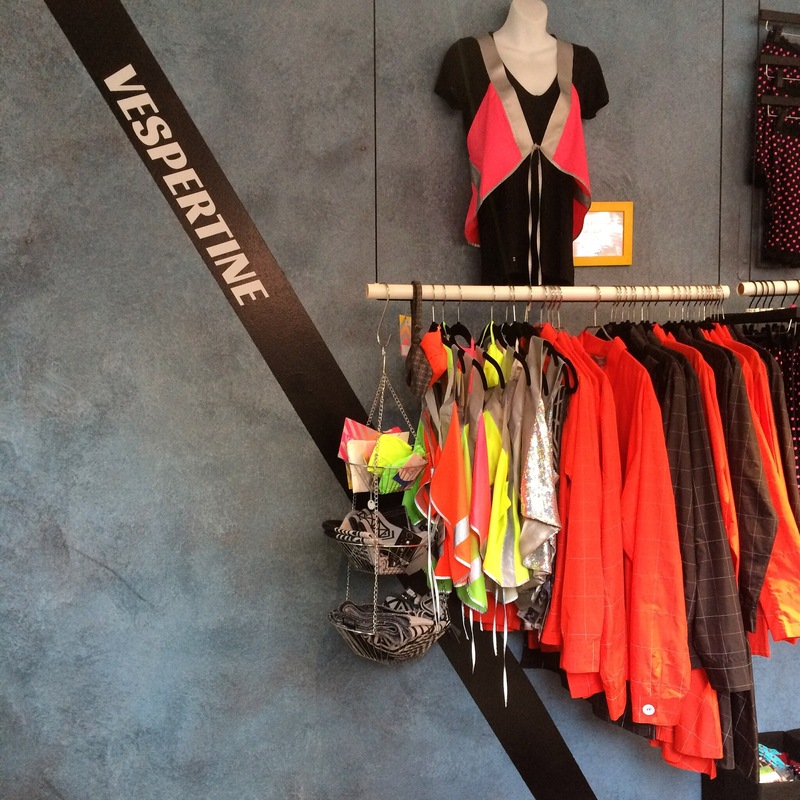 Brands like Vespertine NYC provide stylish reflective vests, jackets, scarves, and dresses. Flashing lights can make it harder for others to gauge distance and are unsafe (to others) as front lights. Lights vary, so be sure you know how effective the lights you have will be. Consider also whether they will require battery replacement or can be recharged. Lights are often stolen from parked bikes, so consider lights you can easily carry with you. Alternatively, dynamo lights whose power is generated by the front wheel and integrated into the bike design are less easy to steal from a parked bike. If the distance is too great, one direction is too hilly, or you feel more comfortable knowing you don’t have to ride both ways, look into the options for public transit. Some cities allow bikes on trains, buses, and/or subways, others allow them only during non-commuting hours, or have limited space. Some commuters use public transit for part of their route, or in one direction. Others take public transit (or drive) at the beginning and end of the week to carry clothes and other items for the week, and use the bike in between. These options can also be your back-up in case of weather or an equipment mishap. It’s true: bike commuters have more fun! Go ahead and give it a try. Keep in mind that it gets easier the more you ride to work, as you will get more comfortable on the bike, discover better routes, and hone your gear logistics. It’s OK to start out as a fair weather cyclist, or to hold off before you start riding at night. Riding in inclement weather or in the dark or every day can be goals to set for the future. You can strive for more as you gain confidence (and the addiction sets in). And don’t be surprised if you start noticing an extra spring in your step when you arrive at the office! Can you spot all the Ride In Style gear in this photo?